Without the right tools, it can be difficult to do our jobs well. An uncomfortable chair or wonky writing desks makes doing anything at the computer for longer than 20 minutes a huge pain. You’ll come up with a hundred different reasons to be away from your desk, and this makes your work suffer. And let’s be real: it’s no help if our office furniture is ugly. Working at a huge faux oak writing desk is almost as depressing as working in a cubicle. If you’re nodding your head in agreement with all this, then you know it’s time for an update. Besides, why are you working this hard if you’re not going to reward yourself for your efforts once in a while? You’ve probably heard at least one or two of your friends bragging about the new standing desks they just got at work. They go into detail about the negative effects of sitting all day at work and how it can lead to heart disease and other ailments. Hearing this, you’ve thought about getting one of those nifty new desks for work. It couldn’t hurt to burn calories and write at the same time. But wait a minute. In an article recently published by NPR, sit-to-stand desks are not proving as healthy as was originally thought. NPR writes that in examining 20 of the leading studies on sit-to-stand desks, there is no evidence to support that these desks are improving user health in any way. Sure, users are burning a few more calories a day, but not enough to make a marked difference. So you tell me what’s worse: standing all day until your feet ache, sitting at a shaky desk or replacing it with a new one? We all deserve a treat for how hard we work. We deserve a work station that supports us during our long hours on the job. 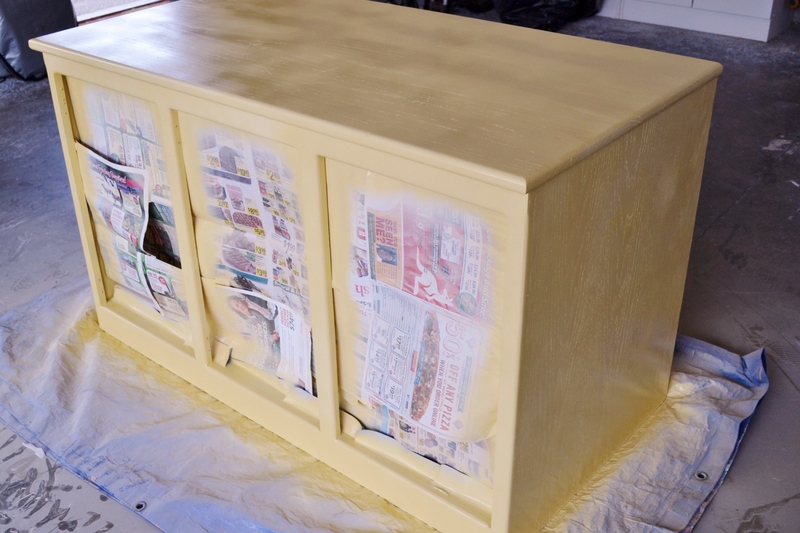 Here are four writing desks that will help to inspire and create. What does every work station need? Good lighting, a comfy chair and a solid desk. How can you expect to be a rock star if you don’t have the right instruments? 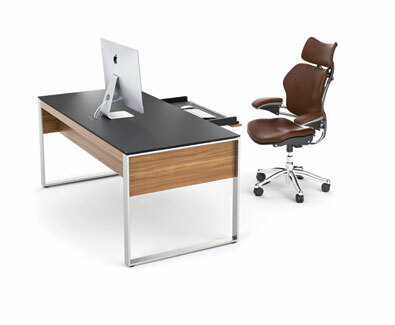 BDI’s Sequel Executive Desk is one of the best desks made by the company. 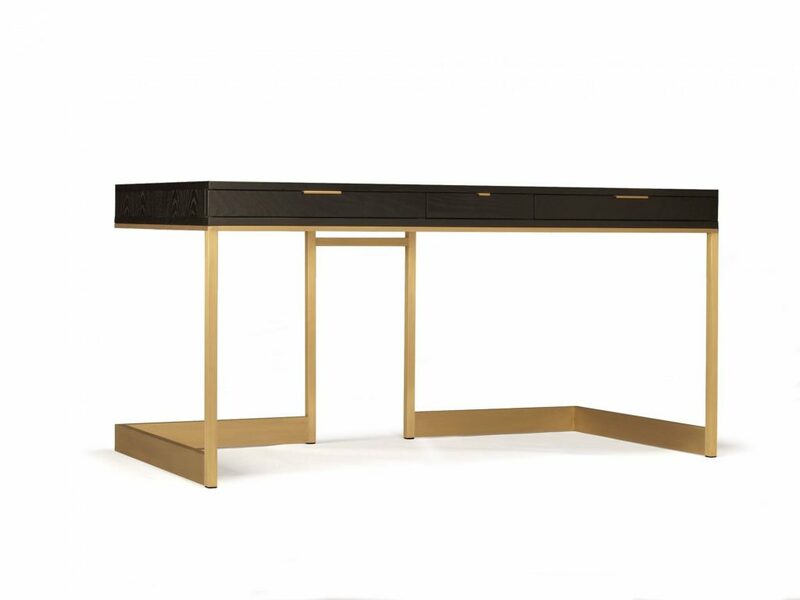 Measuring at close to 6-feet in length, this desk has a strong steel frame with a micro-etched black glass top. Completed with a wood veneer finish, BDI’s desk is magisterial in its design and will make you feel like you are in complete control of your work and company. It’s not always easy to find a desk that is both stylish and functional. 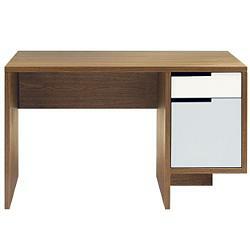 But Skram Furniture has done it with the Wishbone 3-Drawer Desk. The matte black steel frame supports a hand bookmatched hardwood veneer and comes finished with a hand-rubbed hardwax oil or water-based polyurethane. And don’t let this desk’s beautiful simplicity fool you. It comes with three drawers that disappear into the front of the desk as if by magic, leaving you with plenty of storage space for all of your other office supplies. Some of us want something a little more rustic and familiar for the home office. The Modu-licious Power Deskette by Blu Dot features the usual desk design but with a twist: we get to mix and match the body finishes with powder-coated steel drawers. We can have three different colors in one desk and organize our drawers by a color-coding system without relying on folders or other wasteful paper products. 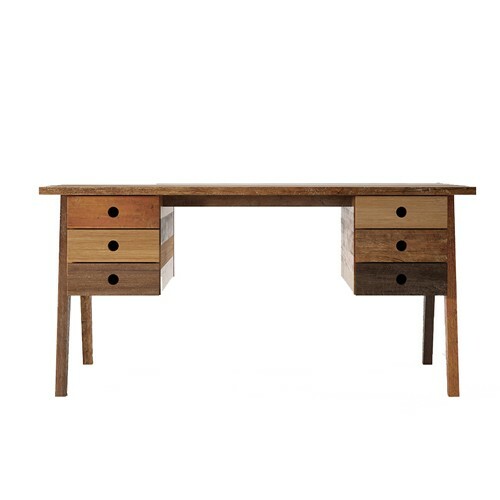 Continuing with the theme of rustic eclecticism, the Brooklyn 6-Drawer Desk by IonDesign is built out of reclaimed hardwood. The natural beauty of the mixed hardwood gives the desk a romantic sort of vibe, helping to elevate your mood and make you feel passionate about your work again. If we don’t have the right kind of desk, our work isn’t going to be right either. So go ahead and splurge on your office space—you deserve it!